This site contains the Board's decisions. All decisions are full-text searchable from the Search box at the top of every page. New decisions are typically added to this website on Friday. Indexing, a process which makes a decision available to the search engine, is performed daily. Despite this frequency, it is possible that the search engine will fail to identify a decision even though it has been posted. If you are seeking a decision that was issued recently and is not listed in your search results, please double-check the most recent list of decisions that corresponds to the category of the decision you are seeking. Decisions and other documents on the following pages are available in Adobe Acrobat (PDF) format. They may be searched, displayed, printed, and downloaded. The Board's decisions are listed in chronological groupings. The most recent list of decisions for each decision category may be viewed by clicking on the decision categories below. 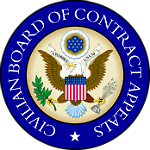 The Federal Acquisition Regulation (FAR) is issued jointly by the Department of Defense, the General Services Administration, and the National Aeronautics and Space Administration. The FAR codifies uniform policies for the acquisition of supplies and services by executive branch agencies. The Federal Travel Regulation (FTR) is issued by the General Services Administration and governs travel and transportation allowances for federal civilian employees and relocation allowances for federal civilian employees and certain new employees. The Joint Travel Regulations (JTR) are issued by the Department of Defense (DOD). They implement statutes and regulations (including the Federal Travel Regulation) pertaining to per diem, travel and transportation allowances, and relocation allowances, with application to federal civilian employees in DOD. The Federal Emergency Management Agency (FEMA) has issued regulations governing the proceedings in arbitrations to resolve disputed public assistance applications arising from Hurricane Katrina and Rita damage.